Lake Wildwood has a beautiful golf course perfectly suited to its most frequent players, retired folks like me. It is challenging without being overpowering -- it forces you to hit accurate shots without sending you into a dense forest when you don't. Trees are carefully placed to block your next shot if you go off line while also adding beauty to the landscape. The greens are raised to require precise pitch shot distance and guarded by bunkers to reward accurate aim. It has four sets of tees to provide enjoyment for all: Blue for young bucks, white for average golfers, red for golfers with less distance, and black to keep the course enjoyable even as strength wanes. Add to this elevation changes on most holes which give striking views as well as interesting shots and you have paradise on earth. The virtual round in the Web pages that follow is primarily from the view of average golfers. The pros in our midst will see immediately how to avoid the pitfalls on which I will dwell. 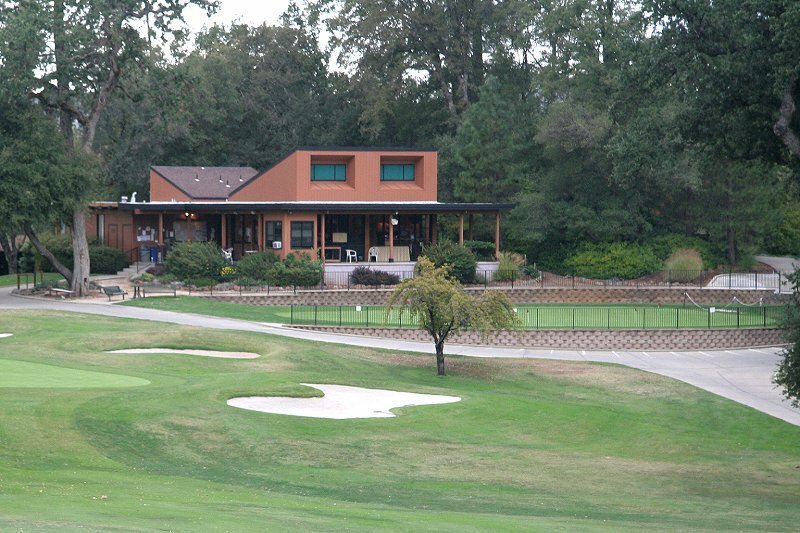 My objective is to introduce newcomers to the course and give them tips on how to play it, while also bringing home its beauty to all of us in Lake Wildwood. You may not want to "play" the entire 18 holes in one sitting, or may also want to just take a quick look at a hole here and there that someone has mentioned. 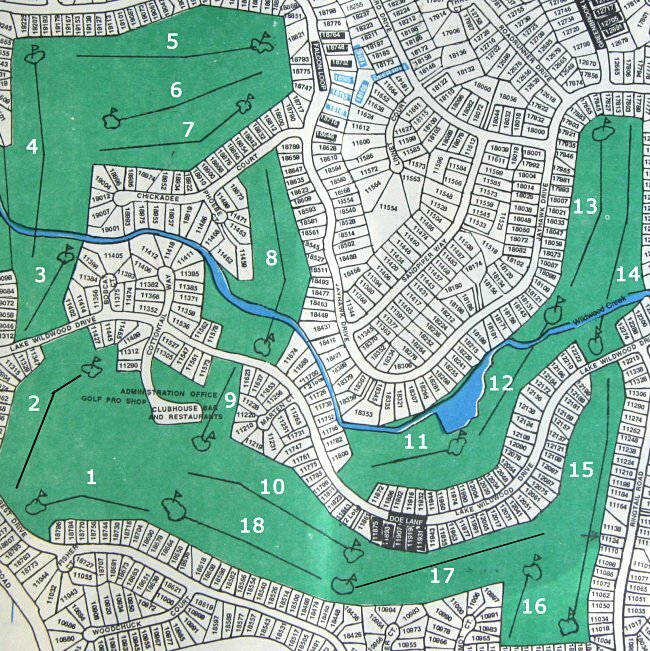 This home base therefore includes the map below of the course with hot links on each hole location which take you to the corresponding page: click on the white numbers. While "on the course," you can continue forward or backward without necessarily returning to the map. Just click on the "Proceed to hole .." or "Return to hole .." at the bottom of each hole page, or return to the map below by clicking on "Course Map". It's worth a quick tour through the course just to see some beautiful views. Don't miss the view from the 4th hole back toward the hilltop tee, the 8th green from your cart at the top of the hill, the signature open-arms oak tree at the 12th green, the expansive view from the 14th tee, the view back from the 17th green, and the pro shop framed by trees and granite rocks near the 18th green. You may see other photos more beautiful to you -- there's something striking on every hole. Click on a hole number to jump to that hole. If you'd also like to see (or would rather see) a more dramatic 13-minute video slide show of the course made with the same pictures but with background music and zooms to show more detail with a 3-D feeling, click on Golf Course Show. If you haven't already done it for other Photodex shows, you will be asked permission to download and install a small plug-in to run the show, which typically takes less than a minute. (Mac users see next paragraph.) When the show screen appears, right click on it and select Full Screen. After the show hit your esc key to return to normal browsing (or right click again and de-select Full Screen). Mac users can see the same show as Golf Course Flash Video. This format requires that I render the video before posting it, which means that it appears in a fixed, relatively small size (but not as small as Flash videos on YouTube) to keep the streaming video file of reasonable size for you to view. The "Golf Course Show" in the previous paragraph is rendered on the fly on a Windows PC machine, so gives a much larger, smoother action show with a much smaller file. To see the Mac compatible show click on Golf Course Flash Video. This can also be viewed on PC machines, but why would you want to? Click Bonus Pictures for a collection of dramatic pictures of the course on a Fall evening. If you have your sound turned on you should also hear some soothing background music.